During football season it can be challenging to sit down for a full meal, especially when it comes to my family and friends. Everyone is usually huddled around the TV, screaming in excitement in hopes that their obnoxious antics will help our team win. Knowing this, I try to design menus to make sure everyone enjoys the food, but more importantly won’t miss one minute of the game. Great tasting dips are one way I can keep everyone happy and full. My inspiration for these dips is rooted in the backyard. No matter what the food is, I want it cooked on my grills because I am looking for maximum flavor. One great way to enhance the flavor in any dip is to add some onions. I prefer using Spanish Onions or Spanish Sweets because of their awesome flavor. These types of onions are perfect for grilling because they have more natural sugar in them than other onions. The more natural sugar the more carmelization you will get which still gives you a solid taste without it being overpowering or underwhelming. 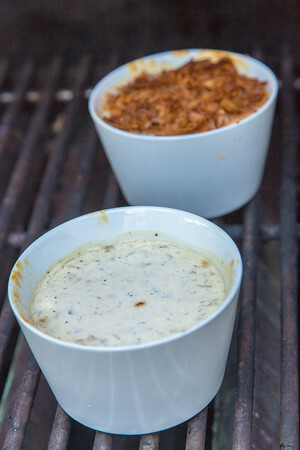 Below is one of my favorite dips to make on the grill. During football season my family is opinionated on two things…how our team plays and how the food tastes. Here are two versions of this dip to make sure it is perfect for everyone. One includes crispy fried onions on top for an extra savory and salty flavor and the other does not. It’s up to your guests and their taste buds what they prefer. Either way you cannot go wrong, so try them both! 1. Preheat grill and vegetable basket to Direct Medium/High (450°-500°). a medium size mixing bowl. Add 2 tablespoons of olive oil, 1⁄4 teaspoon of salt and 1⁄4 teaspoon of freshly ground pepper. Mix thoroughly and set aside. 3. In a separate mixing bowl combine the remaining ingredients with the exception of the crispy fried onions. Mix thoroughly. 4. Place the finely chopped onions in the vegetable basket and grill 14 to 16 minutes, turning the onions every 3 minutes until they become soft and well caramelized. Remove vegetable basket from the grill and let onions cool. 5. Set the grill for Indirect/Medium grilling (350°-400°). 6. Once the onions are completely cooled combine with the sour cream mixture. 7. Place the onion dip mixture into a 2-3 quart baking dish and place onto the cooking grate over the unlit part of the grill. Bake an additional 25 to 30 minutes. 8. After 15 minutes of baking, open the lid and add the crispy fried onions to the top of the onion tip. Continue baking for 10 to 15 minutes. Serve warm with chips or crackers.